80 Plus is a voluntary certification program promoting efficient engergy use. It certifies that the products have better then 80% efficiency at 20%, 50%, and 100% of rated load. Power supplies certified 80 Plus waste 20% or less energy at specified load levels. 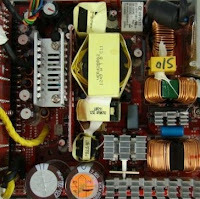 Having a more efficient power supply means less power is wasted as heat. Your power supply's efficiency varies depending on the demands being put on it. Generally a power supply is most efficient between 40% to 60% load. Most of the time your computer will be idling. Ideally you want your idle power draw 30%-40%, and max draw fall between 70%-70% of your power supply's rated wattage. 80 Plus tests are performed at room temperature (23°C). Power Supply efficiency lowers the hotter it is.